Second post in one day! 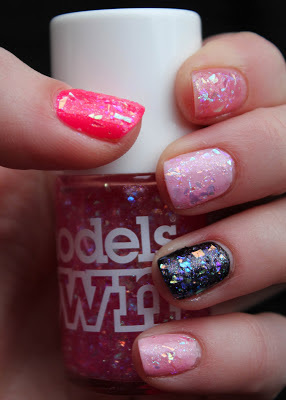 Here's the next one of the more detailed swatches of the new Models Own Splash Collection glitter polishes. This one is the pinky one. As I said in my post on the orange Golden Shore, the formula of these polishes is a bit tricky to work with. 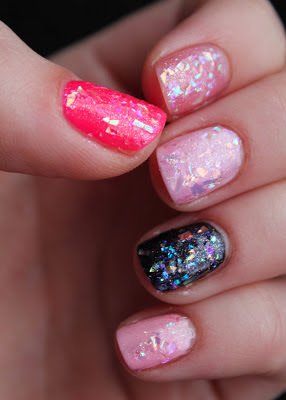 It's quite jelly-like (though not like a gelly polish, I mean like actual jelly) and therefore it can flood the cuticles a bit - the glitter is also a bit of a nuisance to arrange, sometimes you get lots on the brush, sometimes not - which means that you may have to do three or so coats to get full coverage. The glitter is 'hand cut' and so there are a variety of sizes - some pieces are quite large and like to stick up from the nail. Top coat is a good idea! Drying didn't happen very quickly and even with a quick dry top coat my nails felt a bit tacky for the rest of the day. I wanted to see what it looked like over various colours - so I have labelled them on the photos below. On all but the naked nails I used two coats of Pink Paradise. The neon pink was Models Own Bubblegum, naked was with nothing on my nail, white was Models Own Snow White, black was Models Own Black Magic, baby pink was Models Own Strawberry Tart. I really like the look of Pink Paradise over black - it's quite different from Golden Shore as it has a really fine micro glitter in the polish which the orange one doesn't. Click here for the Golden Shore swatch and here for the Red Sea swatch. Which one is your favourite? 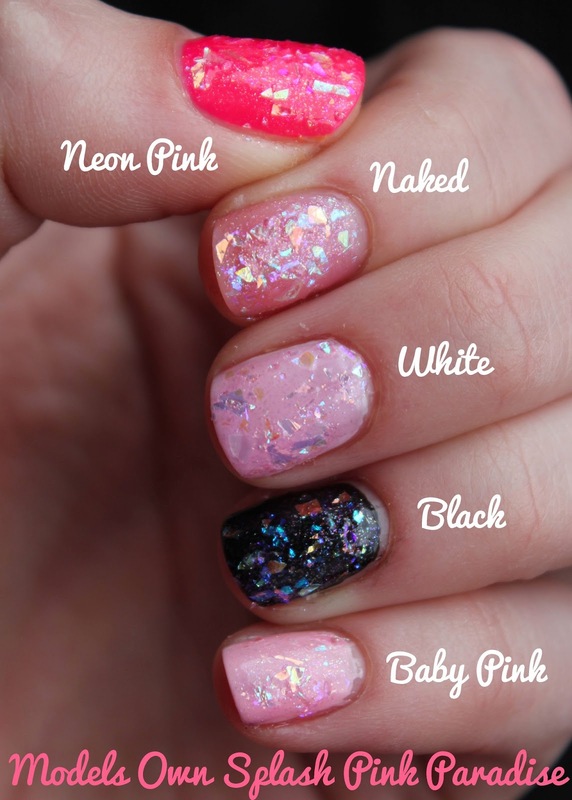 Will you be trying out any of the Splash collection?